The opening scene of Hangmen takes place in a 1963 prison cell, minutes before the execution of a man hysterically proclaiming his innocence. Despite the desperate protestations the chief hangman, Harry Wade, played by David Morrissey, commands his team to proceed, and so concludes a truly arresting first scene. A large portion of the rest of the play unfolds in a dingy pub in Oldham, where landlord Harry Wade passes his time ever since the abolishment of hanging in 1965 left him without purpose. The theatre itself develops into an extension of the pub as cigarette smoke slowly fills the entire auditorium, and those in the stalls slowly perish from second hand smoking. A metaphorical breath of fresh air arrives in the form of Shirley (Bronwyn James), the gullible and clumsy teenage daughter of the ex hangman, who, later in the play mysteriously goes missing. Enter Mooney (Johnny Flynn) – the number one suspect. His character is unnerving from the off – a cocky Southerner who is clearly out of place in this Northern drinking establishment. His flowery language and camp demeanor is bizarrely reminiscent of Russell Brand as the eccentric rock star in the film Forgetting Sarah Marshall – his wrists flailing as he drapes himself over the bar and rather tactlessly describes Northern beer as ‘a little bit pissy’. The arrival of Mooney and his creepy, wry smile conveniently coincides with the disappearance of Shirley and so the first part of the play is left on a cliffhanger. The second half comprises of a search for Shirley, as well as an amusing interaction between smug Albert Pierrepoint and competitive Harry Wade, the two most famous hangmen in British history - although it becomes apparent that Pierrepoint actually completed the most executions, much to Wade’s disdain. While the music effectively locates the film in the appropriate decade in a subtle way, the less than subtle black humour is what really drives the play onwards. Although Hangmen confronts the sinister subject matter of capital punishment, it manages to remain genuinely funny throughout - even the moderately upsetting opening scene has the audience sniggering thanks to the exaggerated acting and clever phraseology in the heated discourse between prisoner and hangmen. 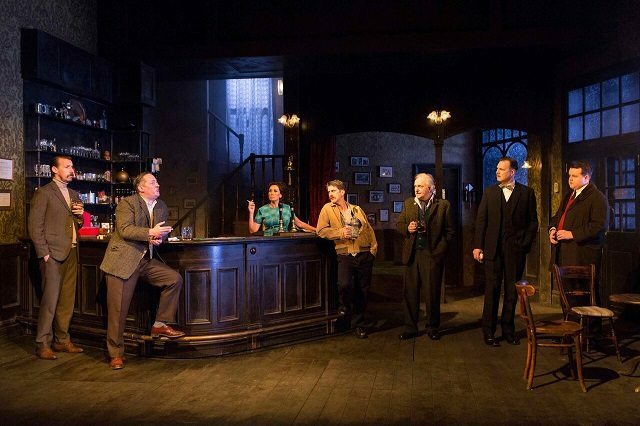 With strong acting performances and perfectly timed delivery, Hangmen is a highly recommended play for everyone, aside from asthmatics.